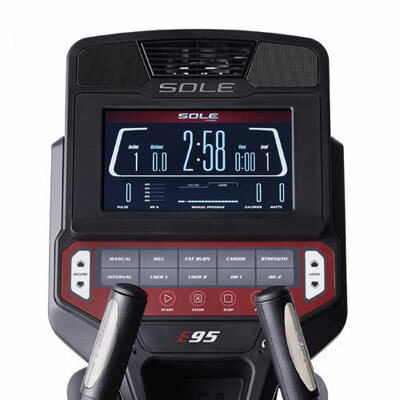 The top of the line Sole E95 Elliptical Trainer is Sole’s best consumer Elliptical Trainer. The E95 model is ideal for your home gym and for fitness enthusiasts of any skill level who want a low impact workout. It is an extra heavy duty machine, capable of handling user weight up to 400 pounds. The Sole E95 Elliptical Trainer provides an effective cardiovascular workout by combining upper and lower body flexibility and coordination into one impact-free motion and is easier on your joints. Regular use on elliptical trainers will increase heart and lung capacity while improving your health and burning calories. The E95 uses 20 levels of Magnetic ECB (Eddy Current Brake) resistance. ECB Magnetic technology has the advantage of no friction, reliability, little to no maintenance costs, and very quiet operation. ECB is usually only found on higher end elliptical trainers and is the best form of resistance for these machines. A heavy duty 27 lb. flywheel provides for smooth strides than other models. The Sole E95’s power incline feature, increases resistance even more while targeting a different core group of muscles. You simply press a button to raise or lower the incline ramp from flat to up to a 40 degree angle. Sole E95 Elliptical Machine Features: Features include a 20-inch elliptical stride. Keep cool with the built-in cooling fan. Built-in Speakers for your iPOD or MP3 player. Handlebar Grip and Chest Strap heart rate monitoring provides your cardio progress on the large commercial grade 10.1-inch TFT LCD screen. Ten (10) workout programs including 2 heart rate programs. Water bottle holder. Adjustable pedals with 10 positions. Oversized, custom-designed foot pedals with durable foam cushioning. Sole has added Bluetooth capability, which can send your elliptical data to a new Sole App on your smart phone or tablet. Smart-Review Commentary: The Sole E95 Elliptical Trainer is a top rated, top of the line, extra heavy duty trainer. 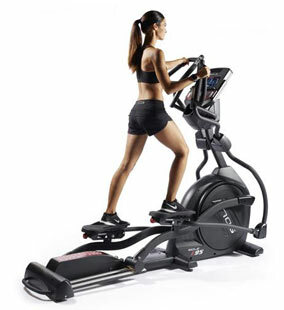 It is our top pick in heavy duty ellipticals (up to 400 lbs. user weight capacity). This elliptical trainer is the top model from Sole. Upgraded features include the power incline feature to raise or lower the ramp with the press of a button, Built-in fan, built-in speakers for your iPod or MP3 Player, and a new 10.1-inch backlit LCD display. This model comes fully loaded, yet is cheaper than higher priced Ellipticals. The Sole E95 uses ECB magnetic resistance (the best type). It has a large 20-inch stride. This model also has 2 heart rate controlled programs. 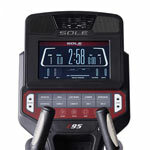 Sole is the leader in mid-priced Ellipticals. For Elliptical Trainers, the E95 is a great deal for the money as well as a well built machine from a company that has received excellent professional as well as consumer reviews on its equipment for many years. It is ideal for those heavy in weight. It is a Smart-Review Top Pick for 2019.